Have you picked up an Android tablet yet? Okay, maybe you’re more of a NOOK HD or Kindle Fire HD kinda guy. Hey, that’s cool too! Whatever the case, statistics show that consumers are buying something for around the home or office. We’ve got something that works for all of you. If you’re like us, you take your tablet with you nearly every where you go, especially on longer car rides. On those times when our family is with us and we’re behind the wheel, the tablet becomes a game console or e-reader. And, now that Google Play lets us rent TV shows and movies, our Nexus 7 has become a preferred way of catching up on favorite films. That’s where the Satechi Headrest Mount comes in very handy. Designed with the same great components and care that we’ve come to love, Satechi has created a wonderful way to transport a tablet. 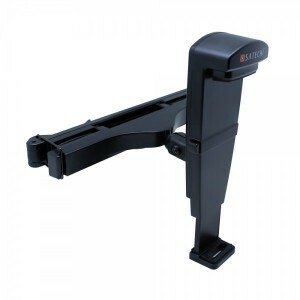 The Headrest Mount works with any tablet size you can think of, including the increasingly popular 7-inch form factor. Yeah, it works for the you-know-what, too. 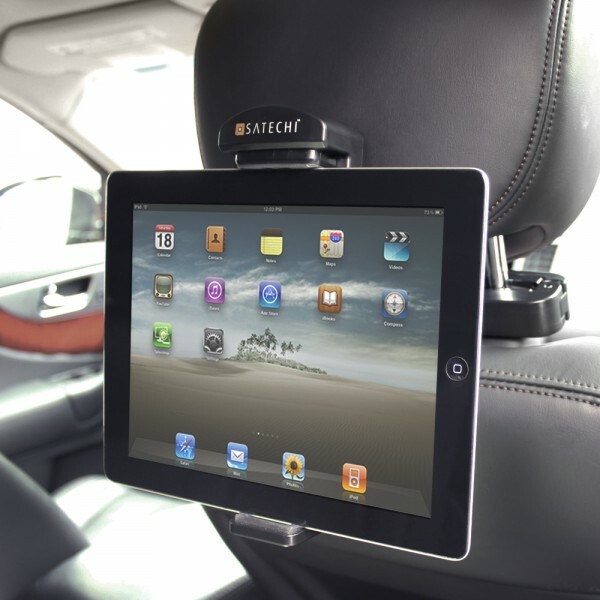 Much like other dash mounts and table docks, the Satechi features padding in the places where it touches your device. In addition to support for multiple sizes, we really enjoy the fact that this rotates to accommodate landscape or portrait modes. What’s more, the 360-degree rotation makes it a breeze to flip from reading a book in one direction to playing a game in the other. Ready to remove the tablet? Push the button on the left and the arms loosen up – away you go. How does mount this in the car? Oh, that’s easy. Simply lift up your headrest a bit, wrap this around the bars and lock it down. If the description sounds a little weird or all-too-easy it’s because of how little effort is really required. 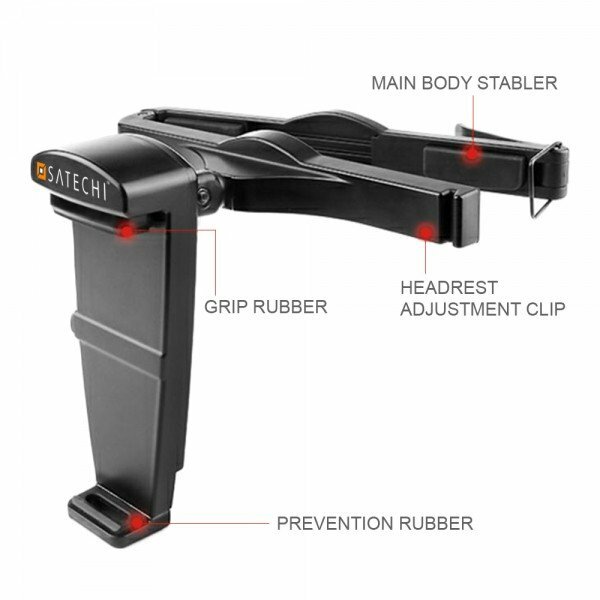 We’ve really enjoyed our time with the Satechi Headrest Mount and have certainly recommended to every passenger that’s been in our car. Because of its flexibility and easy installation, we’ve been able to bring it with us on rides with others. If you have a tablet and a child then you need one of these for your car – period. For movies, games, reading, and other tablet usage, this is well worth the money. Compatible with iPad 1/2/3, Kindle Fire, Samsung Galaxy Tab, and many more. Fit every tablet we tried, in both landscape and portrait orientations. Passengers don’t like hitting their head against the hard plastic. As is the case with just about everything we review here, you can find a lower price on Amazon than through the manufacturer website. The headrest unit we tested retails for around $40 on Satechi’s website however Amazon is currently offering the same thing for less than $30.